I was very kindly invited by the lovely team at Conrad St James to stay the night and sample their Candy Shop Afternoon Tea. If you don't know, I'm now an afternoon tea connoisseur. Myself and my blogging friends have made it our mission to try every afternoon tea in London, and I think we are doing pretty well so far! Staying in a hotel in London is something of a luxury for me. I've lived in London my whole life, so I generally always come back home instead of staying in a hotel as it's so much easier for me. Hotels are something I do when I go abroad. So it felt a little strange getting off the tube to St James Park to settle in. Upon arrival the lovely team at Conrad welcomed us and helped us settle into our room. After walking through an extremely luxurious lobby we arrived into our room. Am I the only one who starts running around looking at everything as soon as I get in the room? We were kindly given a King Junior Suite which meant we had a very luxurious room with a lounge area and desk area and a large TV while also having access to the Executive Lounge; a private area for those who have booked Executive Rooms, Suites and Diamond Tier HHonors members. In this room you can have breakfast, snacks, cocktails and canapés while relaxing away from the hustle and bustle of the busy London streets. Conrad is also a great place to get some work done as I felt so inspired by the beautiful views outside our window. What's so great about the location of Conrad St James is that it is central enough to be close to the main attractions, yet far enough not to be too busy. For dinner, there are only a handful of restaurants nearby so we decided to get out of St James and as it was such a beautiful evening we took a short walk (20 minutes) in to Covet Garden and chose a small italian restaurant to dine in. It's such a lovely walk, you get to walk past St James Park, through the Queens Guards and past Downing Street, while looking at the beautiful London Skyline and Trafalgar Square. What's better than that? As a Londoner I knew where I wanted to go that evening, but I have to mention that Conrad is also known for their excellent concierge team. So if you're not too familiar with London they are sure to help you out. After a wonderful evening in Covent Garden, we headed back to the hotel to explore the Executive lounge. 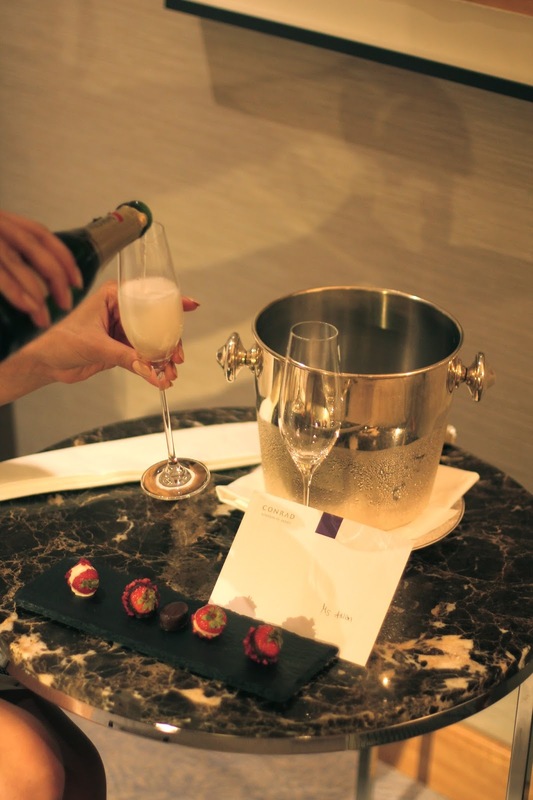 After a few drinks we headed back to the room to find a bottle of champagne (I was told this is the queens favourite) and chocolate covered strawberries. After sleeping in what is possibly one of the comfiest beds I've ever stayed in, we woke up early and attended breakfast in the Executive Lounge. A buffet style breakfast with the option of al a carte including croissant, pancakes eggs, you name it. With breakfast out the way, I decided to have a bath before getting ready for Afternoon tea. There's something so nice about getting ready in a hotel. There's not as much clutter and I for one, seem a lot more relaxed getting ready in a place that's so minimalistic. 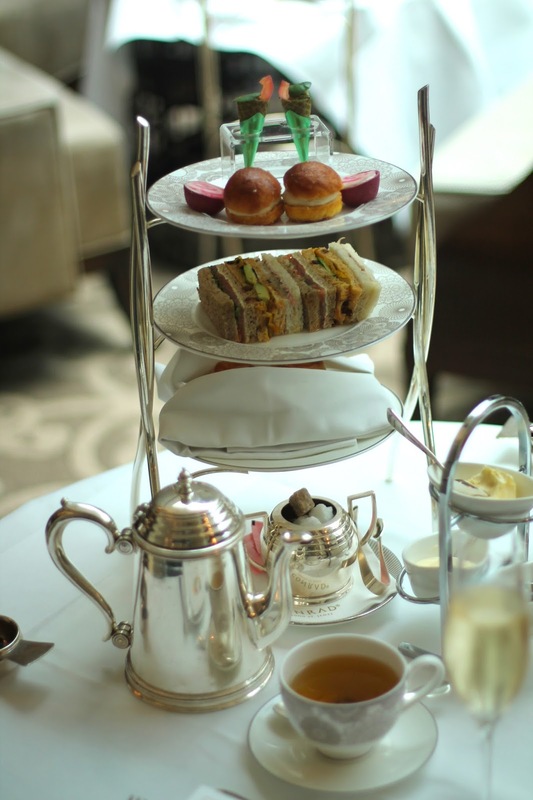 Now, Conrad St James is renowned for their afternoon tea. People come from all over to sample their delicious menu and I can see why. We tried the Candy Shop menu. It was sweet, delicious and looked absolutely amazing! The savoury menu consisted of pesto cones, humus rolls, and an array of delicious sandwiches. My favourite part (as always) was the scones (how do you pronounce it). There was one which was spiced and one with candied pineapple. I for one can not stand cinnamon, but I fell in love with the pineapple one so I swapped and had 2 of them. I've never had anything like it before. The clotted cream, jam and lemon curd was to die for! 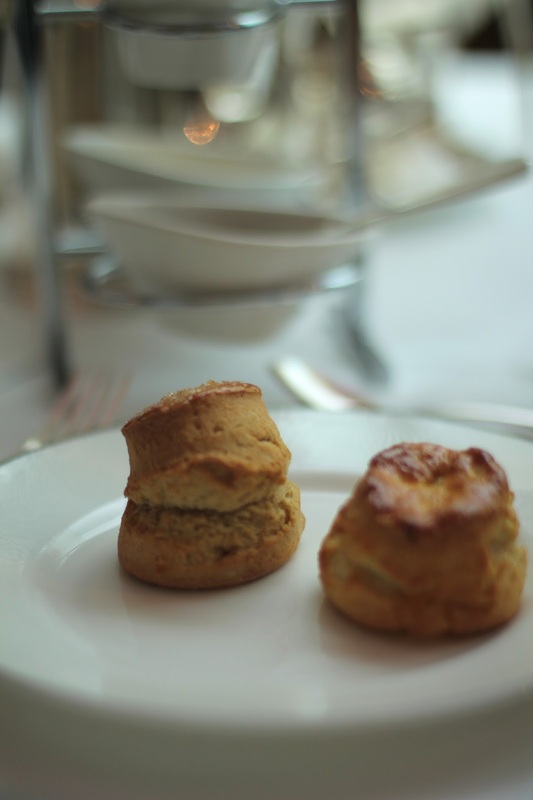 What's your favourite part of Afternoon Tea? After all that food, I forgot there was another course of sweet treats. An afternoon tea is a marvellous way to spend the weekend with loved ones, as the food, champagne and tea is constantly flowing. With a variety of different flavourful deserts, the raspberry cake was definitely my favourite. It was extremely light and quite refreshing after trying all the rest. Thank you to all the staff at Conrad St James for such a wonderful time, the staff was ever so friendly and helped assist us in anything we needed. Who knows where I'll be staying next. 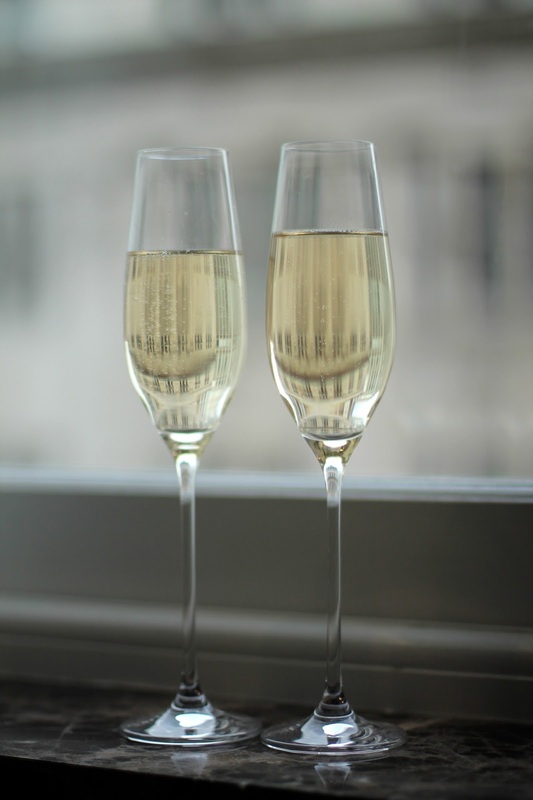 Have you ever stayed at Conrad St James before?